Mustard Floral Top Primark Size 14. Condition is Used. Dispatched with Royal Mail 2nd Class. primark size 10 Blouse . Condition is Used. Dispatched with Royal Mail 1st Class. NEW Disney Women's Mickey Mouse Print Collar Shirt S UK 10 - 12 Long Sleeve . Condition is New with tags. Dispatched with Royal Mail 2nd Class. New Primark Floral Top. Condition is New with tags. There are two little marks at bottom of top in the actual fabric.Dispatched with Royal Mail 2nd Class. 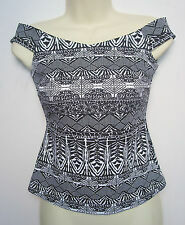 Primark Ladies Geometric Print Shell Top T Shirt Size 14. Condition is Used. Dispatched with Royal Mail 2nd Class. Primark Green & White Striped Vest Top - Uk Size 18 The condition of this top is used. very cute striped Primark vest top, used condition however it is like new. lightweight and thin material (100% polyester) make it great for spring and summer. this vest top has one very small loose thread (pictured) however should not be an issue as not major defect. Dispatched with Royal Mail 2nd Class. ladies tops size 14 new with out tags. Navy. Dispatched with Royal Mail 2nd Class. Ladies floral cami tops size 16 fits large 14. Nice floral cami..great condition . Women’s Off-the-shoulder Black Top With Rose Detail On Sleeves Size 20. Used good condition. Items are posted within 2days of receiving payment. Items won Friday-Sunday are posted on Tuesday, pending payment. Postage cost includes packaging. I always leave feedback, so please return this gesture. Thank you for looking. Primark off the shoulder top. Condition is Used. Dispatched with Royal Mail 2nd Class. women’s top size 20. Condition is New with tags. Dispatched with eBay delivery – Shutl 2-3 days. Primark Ladies Blouse Size 20, Beautiful Design, Brand New Without Tags. What we have here is a beautiful brand new without tags blouse from Primark in a size 20. It has only been tried on. Postage will be charged Please check out my other items I am more than happy to answer any questions asked I am more than happy to combine postage just ask. New items added daily. Bust : 40". Length from underarm : 16". This lovely top has an elasticated neckline, and can be worn on or off the shoulder. It has tiered style sleeves and a neck tie. White Short Tie Shirt Size 20 Primark Still In Store. Condition is New with tags. Dispatched with Royal Mail 2nd Class. Womans Primark White With Black Hearts Tie Up Bottom Top Uk 20 Bnwt. Condition is New with tags. Dispatched with Royal Mail 1st Class signed. The material has a knobbled effect running throughout. On the front there is 5 buttons that is deciration only. The bottom has a tie up design please see pictures as these form part of the description. This has never been worn and still has the labels attached. I accept payment by pay pal only and require payment within 3 days of auction ending. I will endeavour to post within 2-3 days of receiving payment. Lo ng s le ev es. Primark Camisole Top Size 18 animal print . Condition is New with tags. Dispatched with Royal Mail 2nd Class. Primark Size 16 Long Waist Coat Top Cover Up . Condition is New with tags. Dispatched with Other Courier (3 to 5 days). Primark Pink Embroidered Floral Basque Size 10. Lace & hook & eye fastening 15ins in length Condition is Used. Dispatched with Royal Mail 2nd Class. PRIMARK Maroon Long Sleeved Light Top Size L (14/16). BRAND NEW WITH TAGS. Bought but didn't fit Dispatched with Royal Mail 2nd Class. Primark cream off the shoulder top size 16 new with labels. Recently bought from eBay but it's not me. It has short sleeves and really is nice. I just don't like the style on me. I don't post on Mondays but please bear with me when it comes to posting as I suffer with chronic pain and I have to take each day as it comes. PRIMARK White Butterly Print Camisole Size 10, has been worn but in a good condition. Adjustable straps and material is sheer. Primark Coca Cola tee shirt. Size M. Condition is new with tags. Dispatched with Royal Mail 2nd Class. Please see my other items. Having a clear out. BNWOT from Primark a black & pink floral top with long sleeves that have bell shape cuffs and tie at back of neckline. Size 8, the underarm to underarm measures approximately 36" and the length from shoulder to hemline is approximately 24". Lovely top from a clean pet and smoke free home combined postage given on all my items. Womens peach blouse with ruffle around top of the chest. it has a catch along the front of blouse (see photo) buttons down the front, long sleeves with frill around the sleeves. used but in good condition.